The June bugs are thwacking. The humidity is creeping. The neighbors are hanging about the hedges. Honeysuckle is on a rampage, dogs are panting with dorky grins on their sun-hot faces, and the sno cone stand is calling our names. Yup, the signs all point to it: summer is upon us. 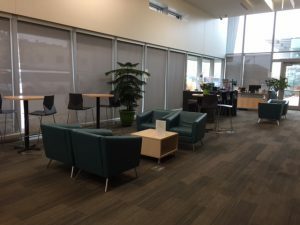 At the library, those who staff the children’s area perform a mental huddle before schools let out this week, when the pitter-patter, er, more accurately—the stampeding footfalls—of vacationing students come hurtling through the library doors. But we've got this, nbd. We're pros at setting up memory-making fun for summer vacationers and thrusting exactly the correct books in their direction before that old siren song of summer ("I'm booorrrreeeddd!") erupts from their lips. We’re ready for you, Lawrence kids. Pictured are five of the students who participate in Tech Team at Billy Mills, left to right: Jack, Timo, Kyle, Chase, and Rylee. 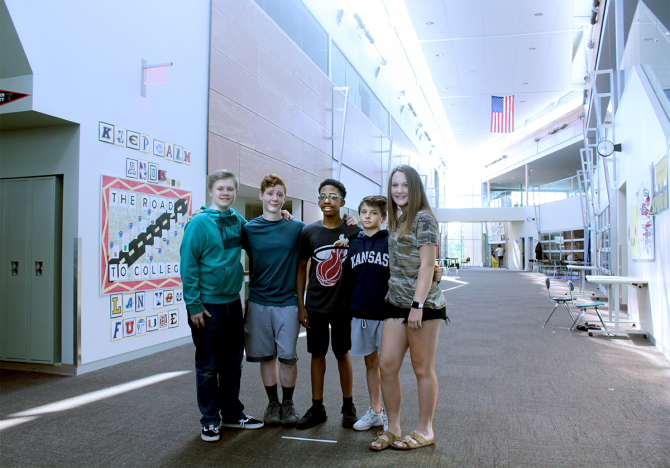 The team came up with the idea to make a Summer Reading Challenge video, and it quickly got the attention of school administrators at the other public middle schools across town. Students at Billy Mills Middle School (formerly South) already have a head start. They've been challenged to a good, old-fashioned reading challenge. And the word is that all public middle school students in town are in on the competition. A couple weeks ago, when summer seemed innocuously distant, Erica Segraves, LPL’s teen librarian, and Jennifer Scotten, Billy Mills’ librarian, talked about their mutual obsession—compelling tweens and teens to read through any means necessary—during one of the many school support visits Erica and Vanessa Reynaga and other library staff carry on throughout the school year. Vanessa and Erica lure middle schoolers to the pop up library in between classes on a recent school support visit. Erica also leads book talks and knows a lot of the students at all the middle schools in town by name. 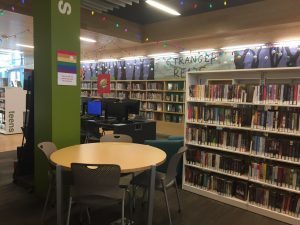 Scotten, Jones, and Segraves theorized that, if the public library and the middle school libraries joined forces to amp kids up about Summer Reading, they could arrive back at school and hit the ground running this fall. 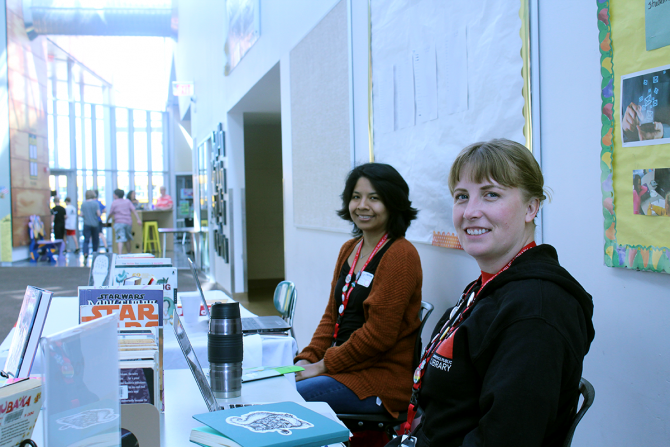 Left to right: Billy Mills Librarian, Jennifer Scotten, Americorp VISTA Volunteer Coordinator Vanessa Reynaga, and Erica Segraves, LPL Teen Librarian often talk about ways the public library can amplify what the school librarians are up to, and vice versa. Educators and librarians stand united against the “summer slide” - a phenomenon that robs school children of proficiency at the skills they’ve learned during the school year if they don’t get served with generous portions of brain food during the summer months. 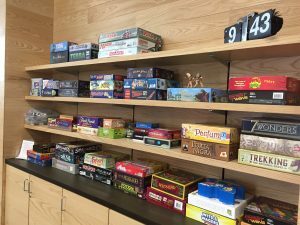 It turns out that reading and attending learning-centered programming at the library helps with retention on all subjects, not just reading and writing. “What’s really at the heart of it is parent and student interaction,” says Jones. Jones caught whiff of the idea hatched between librarians, and passed it on to Mr. Davis, the Tech Team leader. The Tech Team summoned 12+ members into action. In no time, Dr. Jones and Jennifer Scotten issued an enthusiastic video message directed at incoming and future middle schoolers across the city to take part in the library’s Summer Reading program. There are free Cougar Bucks involved at Billy Mills, and a reputedly gigantic trophy in it if the school wins. 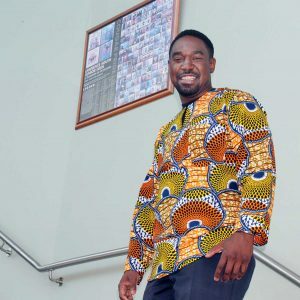 Dr. Keith Jones, Principal at Billy Mills Junior High, is an ever-enthusiastic challenger in the video that dares students across the district to battle it out for a giant trophy and bragging rights. Word got around that West, Central, and Southwest principals weren’t even going to consider backing down. Your browser does not support inline iframes. Visit Summer Reading Challenge. To Jennifer Scotten, Dr. Keith Jones, the Tech Team, and all the students at Billy Mills, the staff of LPL is cheering you on for upping the ante on completing our Summer Reading program. Parental units, take the baton. Hit the pavement. Get down here! Bring a couple tote bags, too, you’re gonna need them. It's time to fill a vacuum in those developing brains with all the nutritious words you can summon from the stacks of the Lawrence Public Library. Be a role model and pick up some books of your own while you’re at it with Book Squad or Info Services Lists galore.